Home Oh My God Festival What historical connection is there between firecrackers and Diwali? The burning of crackers: Its always been a nature of history, that what we see around us today, may not have been because of results of one singular act of events in history, but a combination of results of a number of acts together in history, which led to the very activity that we see in front of us. Interestingly, there is no mention either in Ramayana or any other scripture of those times of burning of firecrackers when Rama along with Sita returned back to Ayodhya in Pushpak Viman. Then how did this act of burning of crackers got associated with the festival of Diwali? As per some scriptures, there was a demon Narakasura who ruled the kingdom of Pradoshyapuram, who was the son of Bhumi Devi. He had a boon that he could be killed only by his mother. and Bhumi Devi had already died in his childhood. That had made him immortal in a way. The king was evil and had even troubled Indra with his atrocities. Indra requested Krishna to end the evils of Narakasura. Krishna requested his wife, Satyabhama to accompany him in this quest as he was aware that Satyabhama was the reincarnation of Bhumi Devi. Krishna fought an epic battle with Narakasura and destroyed his army but was heavily injured by Narakasura because of his boon. Seeing an injured Krishna, Satyabhama picked up his Chakra and killer Narakasura out of fury. Before his death, he requested for a boon from Krishna and Satyabhama that people should celebrate his death anniversary by lighting up their houses, distributing sweets and bursting firecrackers. His boon was granted by Satyabhama and Krishna and they blessed him that his death anniversary would be celebrated on the day of Diwali, which was already celebrated to mark the return of Rama and Sita back to Ayodhya. 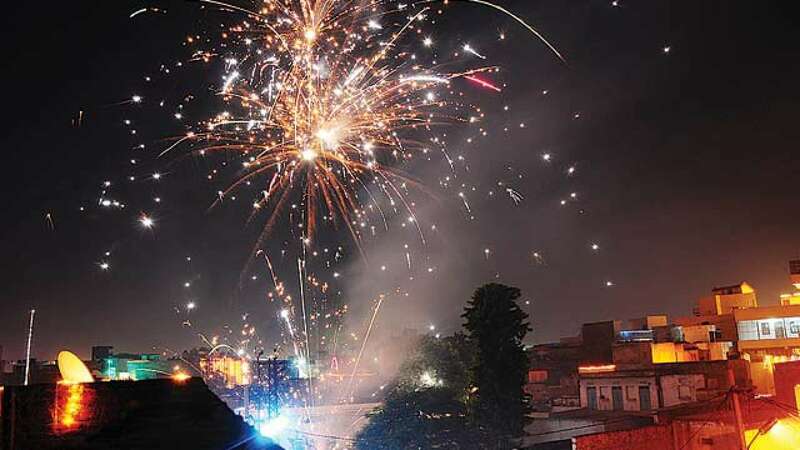 The scientific angle: Believe it or not, there is a very scientific angle reated to burning of crackers and lighting lamps around this time of the year. Diwali comes at the onset of winters, and the rainy season is almost coming to an end. The etymological reasons: As per certain historians, the practice of burning of crackers originated in China as a means of warding off evil and notorious spirits by scaring them with loud bursting sounds and lights. Soon, this practice spread to other parts of the world, including India. In the early days, the practice of burning of crackers and lighting of lamps was done to entertain the royals and the kings only, but soon, the practice associated a religious significance of symbolizing the victory of good over evil with itself, and burning of crackers became a regular practice at Diwali. People had already been celebrating Diwali by lighting lamps, and cleaning their houses by then, as a mark of return of Rama and Sita to Ayodhya, and soon other practices also came to be getting associated with Diwali. Previous articleThis Beautiful Ad Film On Diwali Will Make You Tear Up.